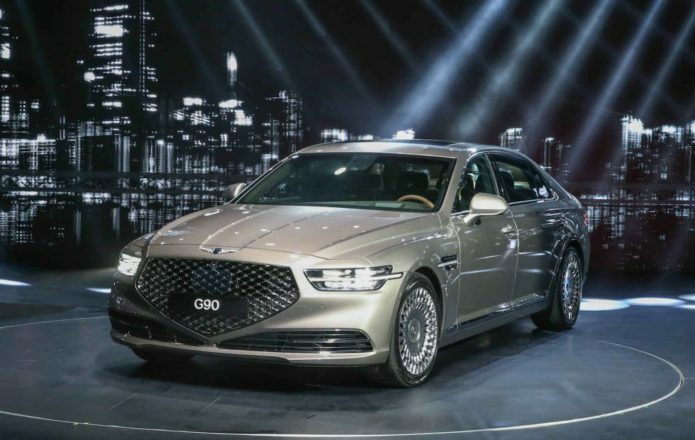 Genesis has revealed the 2020 Genesis G90, the refreshed and redesigned luxury sedan that sits as the flagship of the South Korean automaker’s range. Promising crisper styling that’s more memorable and distinctive, the new 2020 G90 paves the way for Genesis’ big push into SUVs, with three planned by 2021. Most noticeable, of course, is the G90’s new grille. Dubbed the Crest Grille, it plunges deep into the front bumper, and is now flanked by Genesis’ Quad Lamps headlight design. They feature reflecting diamond detailing and wrap around the front edges of the car.